GH3HC-492 | Size: 50 ml / 1.69 fl.oz. 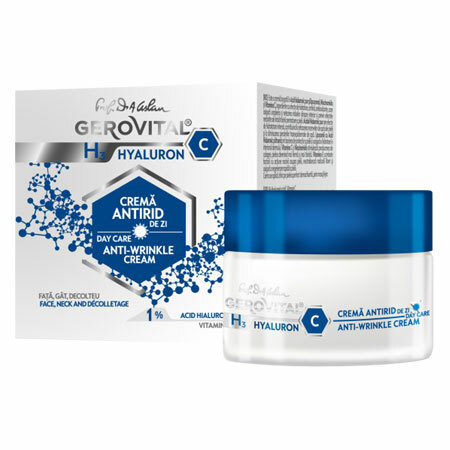 The new Gerovital H3 Hyaluron C line features a combination between the Hyaluronic Acid and Vitamin C - a powerful anti-aging combo, both ingredients being proved to prevent and repair free radical damage to the skin, protect against UV sun damage and stimulate collagen production. The Anti-Wrinkle Cream for day is rich in pure and liposomal Hyaluronic Acid, Niacinamide (Vitamin B3) and Vitamin C, ingredients with moisturizing, anti-wrinkle, and anti-oxidative effects. A concentration of 1% pure hyaluronic acid helps restore the ideal level of hydration for the skin and reduces the trans-epidermal water loss (TEWL). Hyaluronic Acid has the ability to pull water to an area and thus swell it so that it makes the skin visibly plumper and fuller. When encapsulated in liposomes, the Hyaluronic Acid is more stable, more effective, having a greater penetration in to the deeper layers of the epidermis. Vitamin C and Niacinamide (Vitamin B3) work great together: stimulate the production of collagen, even the skin tone, fade wrinkles, increase skin firmness and brightness. Vitamin E limits the damage of the external , neutralizes free radicals, seeds up cell regeneration. Usage: Apply in the morning on a cleansed and toned face, neck and décolletage. Use either by itself or after your usual serum. Apply on cleansed face neck and decolletage. Massage gently with circular movements to help the cream's better absorption. INGREDIENTS: AQUA, GLYCERIN, GLYCERYL STEARATE, CETEARYL ALCOHOL, GLYCINE SOJA OIL, SQUALANE, NIACINAMIDE, UNDECANE, PLUKENETIA VOLUBILIS SEED OIL, DIPALMITOYL HYDROXYPROLINE, PHENOXYETHANOL, HYDROXYETHYL ACRYLATE / SODIUM ACRYLOYLDIMETHYL TAURATE COPOLYMER, TRIDECANE, CETEARETH-22, TOCOPHERYL ACETATE, ISOHEXADECANE, SODIUM HYALURONATE, BUTYROSPERMUM PARKII BUTTER, PARFUM, POLYSORBATE 60, PROPANEDIOL, ETHYLHEXYLGLYCERIN, TETRASODIUM EDTA, BHA, ASCORBYL TETRAISOPALMITATE, GLUCOSYL CERAMIDE, PENTYLENE GLYCOL, LECITHIN, CARBOMER, SODIUM HYDROXIDE, CHONDRUS CRISPUS EXTRACT. Dissolves and removes impurities in one swipe.